Everyone at Russkell Furniture has been undecided as to what to include in our exciting Spring Sale. As we couldn't come to an agreement, we have finally decided to offer a 10% discount on absolutely everything in our collection of luxury made-to-order and ready-to-place selection of luxury furniture and homeware! Here we offer a tantalising preview of some of our products; check out this selection and then browse for more to create your perfect space. At Russkell Furniture, our speciality is creating furniture from a vast selection of models, fabric designs and materials. Each piece is lovingly crafted by hand at our specialised factory in Darwen, before being carefully shipped to its intended destination. A truly astonishing array of fabrics and leathers can be rendered in a full palette of colours to match or create any desired aesthetic and provide comfort and support along with style for many years to come. 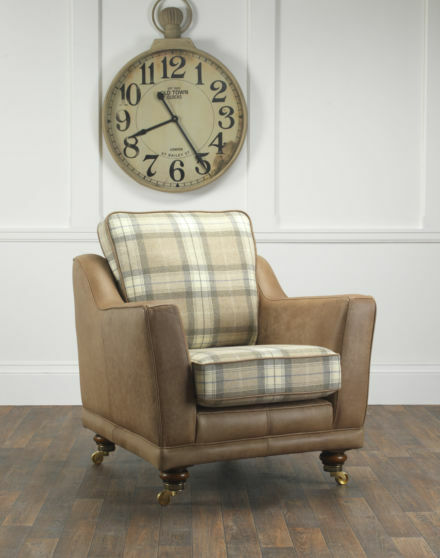 Currently extremely popular in our made-to-order collection is the Queen Anne Chair; elegantly imposing, this gorgeous wingback chair has a perfect finish and can be customised to perfectly complement any space. You can create your own custom piece of luxury furniture in just three simple steps - check out our recent article for further details. Traditional or contemporary, subtle or vibrant, an occasional chair can serve a multitude of design requirements, seamlessly blending into the background or standing out as a focal point. Whichever, it is essential that the chair admirably serves its primary purpose; to provide a place of comfortable, supportive relaxation for the sitter. Russkell Furniture supply an eclectic range of occasional chairs designed to offer something for every aesthetic. Standing tall on four upright wooden legs, the Fleur occasional chair is elegant and understated; rendered in classic white and embellished with evocative French words and phrases, the Fleur chair features tactile and inviting curvature which invites sitters to experience its supportive yet yielding seat. 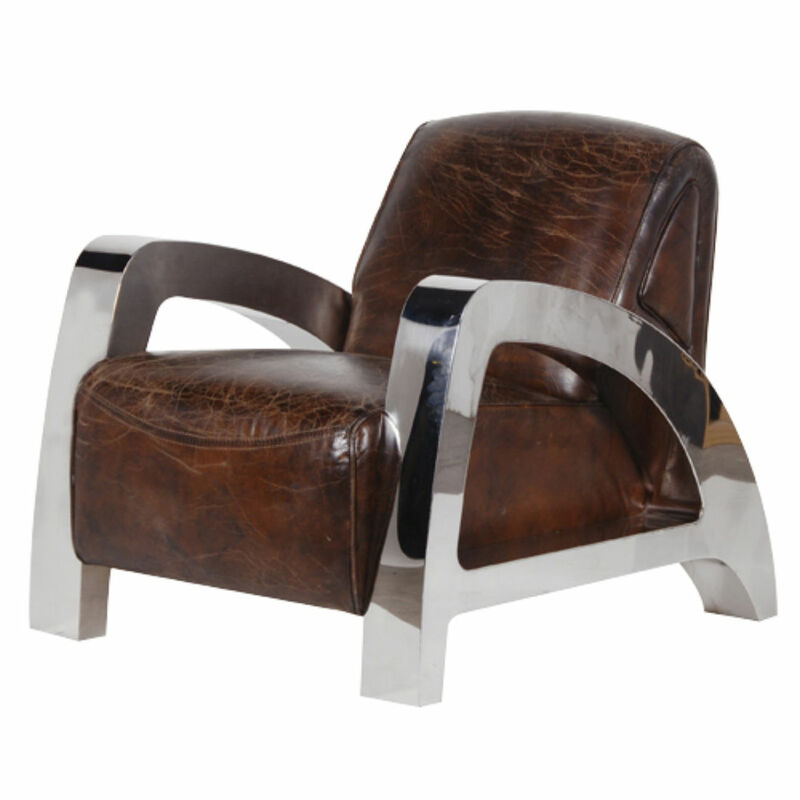 Leather & Steel Low Chair. Looking for the ultimate in sophisticated relaxation? Look no further - the Russkell Furniture Leather & Steel Low Chair easily meets and exceeds expectations. Luxuriously comfortable, this quality piece of furniture is perfect for snuggling up to an open fire or lazing in the conservatory, offering supreme comfort that is conducive to relaxation and rejuvenation. The last word in cool kitsch, this gorgeous chair is striking, bold and dramatic. 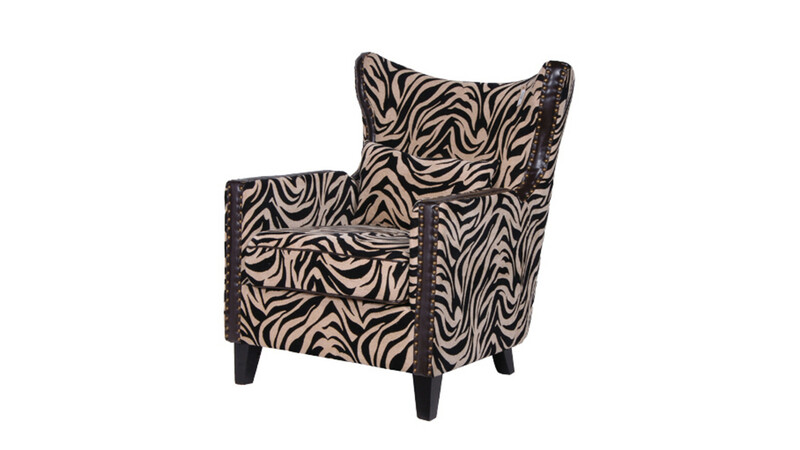 Along with the vibrant zebra print, the chair also features dark legs and studded arms to give a real sense of drama to this creative, unique piece of luxury furniture. The Russkell Furniture range of dining furniture is designed to seamlessly combine form with function, offering robust and durable furniture that effortlessly teams with your chosen style. 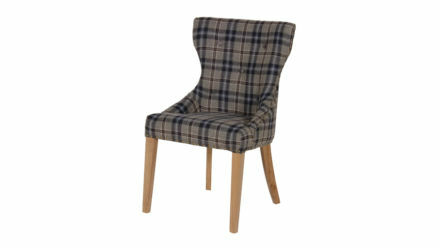 Make sure your dining space is dressed to impress with our fantastic selection of quality dining chairs. This chair is truly magnificent, featuring crisp white linen combined with beautifully carved legs. A comfortably-padded seat provides complete comfort while the straight back adds a touch of regal class and simultaneously offers total lumbar support. Utterly contemporary, this chair has a silky-smooth metal seat and is supported by four legs radiating from a central point beneath the seat and supported by an added framework. This chair is designed to fit into modern, urban spaces and displays a truly eclectic style. Leather Dining Chair with Cushion. Offering the ultimate in dining style and comfort, the Leather Dining Chair with Cushion is supremely beautiful and comfortable. Standing over a metre tall, this impressive piece is rendered in the finest leather and its included cushion provides both added style and support. Please enjoy browsing the full range of exciting products available from Russkell Furniture and remember that, from the 3rd till the 31st of March inclusive, all purchases will receive a fantastic 10% discount in price at our secure online checkout. For more information on the Russkell Furniture range, please call our dedicated customer service team on 01254 773232 or email us at info@russkellfurniture.co.uk.